A flight-proven Falcon 9 rocket lifted off from Florida’s Kennedy Space Center on Friday with Bulgaria’s first commercial communications satellite – marking the opening salvo of a potential SpaceX double header into this weekend as the company’s California-based launch team is working toward a Sunday liftoff with ten Iridium-NEXT satellites. The two-stage Falcon 9 – sporting a previously flown first stage and brand new second stage – blasted off from Launch Complex 39A at 19:10 UTC on its eighth flight of the year, the fourth involving a high-energy Geotransfer delivery. Rising into clear skies over the former Saturn V and Space Shuttle launch complex, Falcon 9 swung to the south-east on the standard route to Geostationary Transfer Orbit, firing the first stage for a little over two and a half minutes before the rocket’s two stages went their separate ways with Stage 1 attempting a difficult high-energy recovery via a Drone Ship landing and Stage 2 fired up its vacuum-optimized engine to head on toward orbit. After successfully dispatching the second stage, the booster, identified by serial number 1029.2 for a re-use mission, had only the bare essentials in terms of leftover fuel, requiring the Autonomous Spaceport Drone Ship to be stationed well downrange of Cape Canaveral as this mission featured a particularly sporty return. The 47-meter long booster continued on a ballistic arc until firing up a subset of its engines to slow down for re-entry, then relying on its four actuated grid fins to steer toward the drone ship for a do-or-die three-engine landing burn to arrest its rapid vertical descent just as the landing legs made contact with the ship. 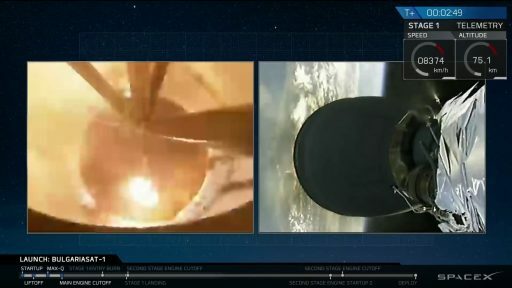 Cheers emerged when video returned after a brief outage and showed the booster on the ‘Of Course I Still Love You’ drone ship after the most challenging return to date, also marking the second time SpaceX recovered a twice-flown booster. In charge of the day’s primary mission, the rocket’s second stage completed an initial burn of close to six minutes to reach a Low Earth Parking for 18 minutes to coasting to reach the proper spot in its orbit for the all critical re-start 27 minutes into the mission to lift BulgariaSat-1 into its planned Supersynchronous Transfer Orbit. Springs pushed the satellite on its way 35 minutes after liftoff, marking the culmination of a project 12 years in the making. BulgariaSat-1 is the first commercial communications satellite for the small Balkan country, hosting an all Ku-Band payload focused on TV distribution to Bulgaria, its neighboring Balkan countries and a large stretch of Western and Central Europe, opening up new capacity and revenue areas for Bulgaria Sat’s affiliate, TV provider Bulsatcom. The 3,669-Kilogram satellite hosts three Fixed Satellite Services Transponders and thirty Broadcasting Satellite Services transponders, underlining the satellite’s primary role in TV distribution with secondary business in networking services and Internet connectivity. 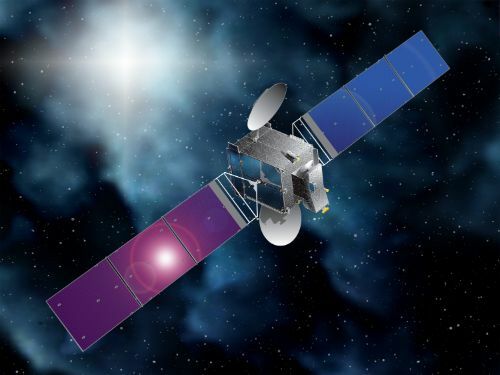 Built for a 15-year service life, BulgariaSat-1 will enable Bulsatcom to add HDTV and 4K business, opening up new market opportunities as 4K Ultra-HD TV distribution is still sparse in the Balkan Region. 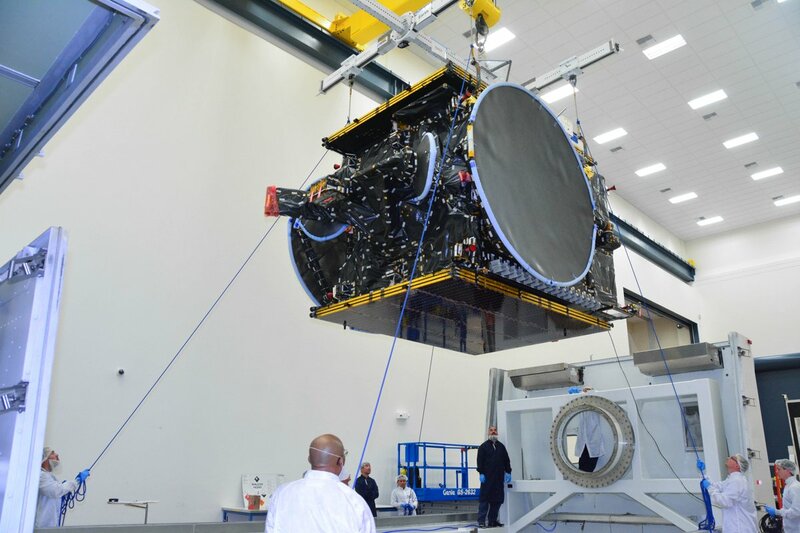 Bulsatcom aims to use BulgariaSat’s added capacity to explore new markets in Serbia, a move previously hindered by the company’s limited leased capacity on the HellasSat-2 spacecraft that launched from Florida 14 years ago. The company will also be looking at completely new areas as BulgariaSat-1 offers more than enough capacity for the broader Balkan region. 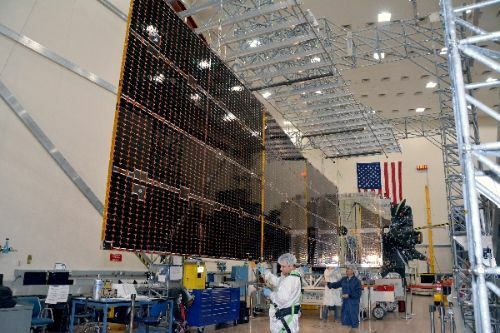 Valued at $235 million, the satellite project was largely made possible through a reduction in launch cost for large Geostationary Satellites, in part due to SpaceX’s ongoing drive to reduce costs. A trend enabled by dropping launch cost has seen smaller countries launching their own communications satellites into orbit instead of leasing capacity with commercial operators. Some nations that opted for independent satellites include Belarus, Laos and Turkmenistan using the cheaper options on the launch market, notably China’s Long March 3B and the SpaceX Falcon 9. BulgariaSat-1 is Bulgaria’s second satellite, coming 36 years after Bulgaria-1300 – a modified Soviet meteorology satellite launched under a program to give other Warsaw Pact countries a chance to promote space flight and operate their own satellites. 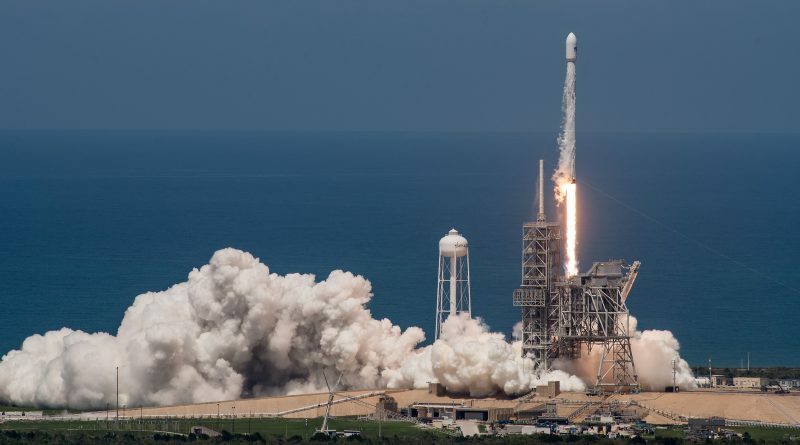 The switch of BulgariaSat-1 to a flight-proven Falcon 9 was announced in early May after satellite manufacturer SS/L finalized the decision for the swap, working in close cooperation with SpaceX, insurance providers and Bulgaria Sat. Per the terms of the ‘delivery in orbit’ contract, Space Systems/Loral is in charge of all aspects of the mission from manufacture & testing, through launch and in-orbit commissioning, allowing the company to re-negotiate the launch with SpaceX. Work to move the satellite to a previously flown booster began well before Falcon’s first re-use mission on March 30 with SES-10, but insurance providers required one successful demonstration of a used rocket. 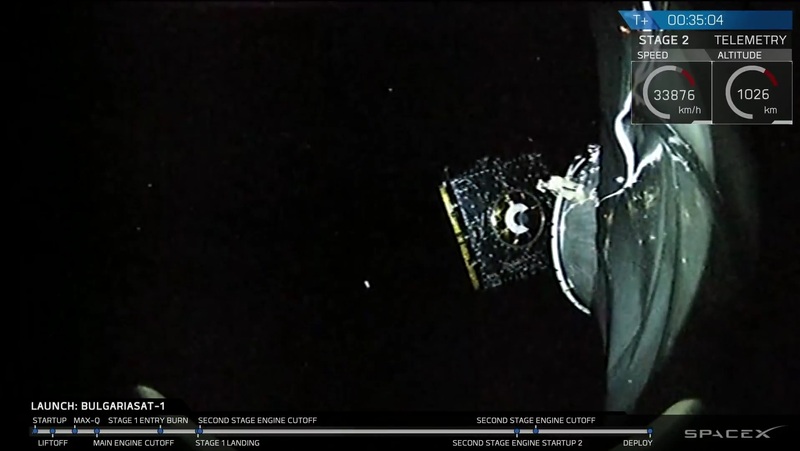 After SES-10 reached its orbital destination without issue, SS/L committed to the re-use mission, allowing BulgariaSat to advance in a fairly crowded launch manifest at SpaceX. One particular bottleneck encountered by SpaceX when it came to stepping up its launch rate was the production of first stages. Reaching an impressive success rate on the booster recovery front, SpaceX was hoping to use flight-proven stages to tackle its busy manifest, however, the company is currently only offering a 10% discount to companies opting for a used booster as it aims to recoup some $1 billion in expenses for the development of the re-usable rocket stage and establishing the required ground infrastructure. The schedule advances possible with re-use missions could be an incentive for a number of companies to commit to the switch over the coming months and years as re-use is streamlined and gets closer to routine. 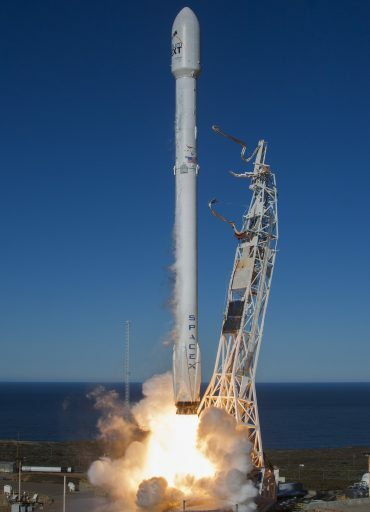 Booster 1029.2, flying Friday’s mission, was the first to launch from both coasts of the United States, making its first trip to the edge of space and back on January 14 – launching out of California on a heavy haul to Low Earth Orbit with the first ten Iridium-NEXT satellites and successfully achieving SpaceX’s first Pacific-based drone ship landing. 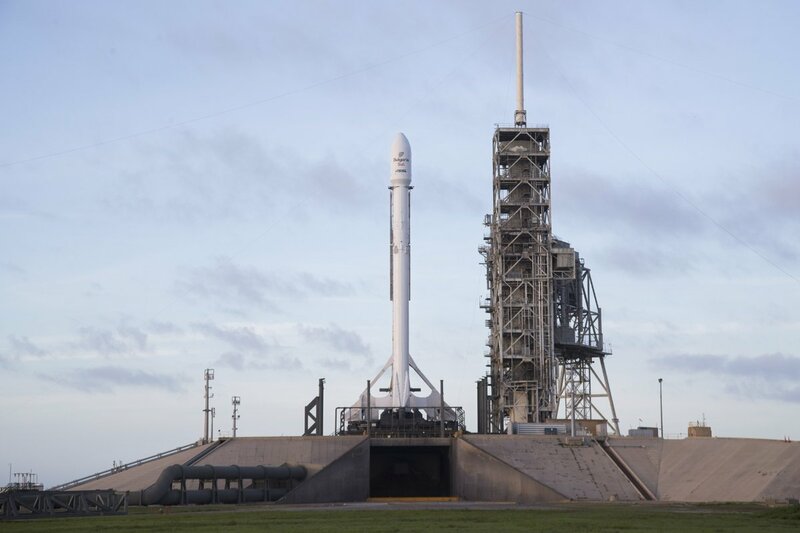 BulgariaSat-1 was originally targeting a June 15 launch date as SpaceX aimed at sustaining a stable two-week cadence at Launch Complex 39A, but a weather related delay to the previous launch and a fairing issue on this mission ended up pushing the launch eight days to the right. Falcon 9 went through its Static Fire test on June 15 and was spotted back at the pad earlier this week to conduct some interface checks with ground pressurization and hydraulic systems. After replacement of a suspect fairing valve were complete, Falcon 9 was able to meet its passenger and returned to the launch pad before dawn on Friday. Falcon 9 – gearing up for its 36th overall launch and the 16th in the Full Thrust configuration – enjoyed a fairly clean countdown from a technical standpoint and had no worries on the weather front after forecasts showed progressive improvements since the weekend. A one-hour delay to T-0 was necessitated by additional tests on ground systems deemed necessary by Launch Controllers – taking advantage of the mission’s two-hour window. 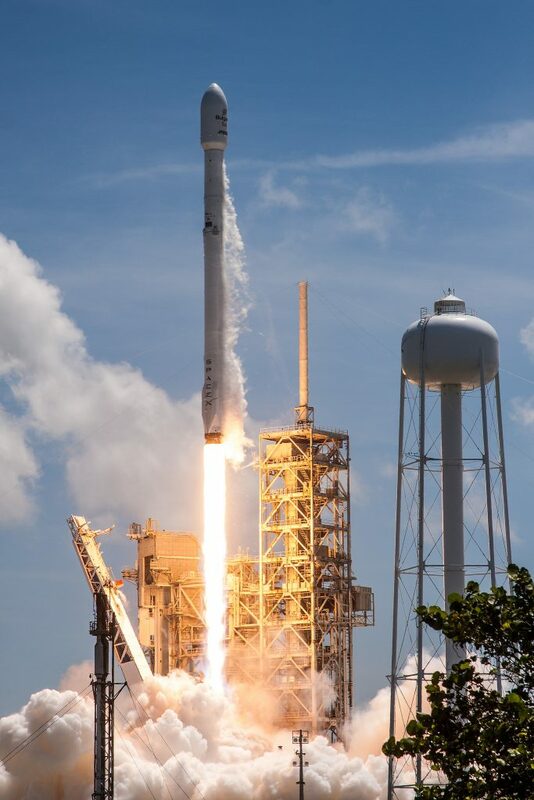 Detailed testing of the rocket awarded Falcon 9 a clean bill of health and a poll of all support stations provided the green light for the fast-paced propellant loading sequence to pick up at T-70 minutes. While Falcon 9 was receiving over 500 metric tons of sub-cooled Liquid Oxygen and chilled Rocket Propellant-1, teams provided an updated flight profile to the rocket’s computers to ease loads experienced during flight and BulgariaSat-1 switched to battery power for its climb to orbit. Final countdown events checked off in the last seven minutes included chilling down the nine Merlin 1D engines, retracting the Strongback structure, transitioning Falcon 9 to internal power, reaching flight levels on all four propellant tanks and handing control over to the vehicle at the one-minute mark. Booster 1029 came to life three seconds prior to liftoff as the typical green flame of Falcon’s igniter mix erupted from the business end of the rocket and all nine Merlins soared up to a collective launch thrust of nearly 700 metric ton force. Liftoff was marked at 19:10 UTC, 3:10 p.m. local time as Falcon 9 left the ground upon being released by its hold-down system. Burning 2,500 Kilograms of propellant per second, Falcon 9 cleared the 106-meter tall tower at LC-39A and pitched over to begin accelerating downrange on a south-easterly flight path across the Atlantic Ocean. The rocket pushed though the sound barrier just over one minute into the flight and the moment of Maximum Dynamic Pressure came at T+79 seconds when stress on the rocket’s first stage reached a peak – a critical point in the flight as it placed the most pressure on the booster’s used air frame. Falcon 9 throttled back briefly around MaxQ before continuing full steam ahead toward its cutoff target. The first stage finished operation as part of the primary mission two minutes and 38 seconds into the flight, having accelerated the stack to a speed of 2.37 Kilometers per second, or nearly seven times the speed of sound. Stage Separation, four seconds after MECO, occurred at an altitude of 68 Kilometers as pneumatic pushers sent the first stage clear of the extended nozzle of the second stage’s MVac engine for ignition. The second stage fired up six seconds after staging, soaring to a thrust of 95,000 Kilogram-force on a planned five-minute and 51-second burn to boost the satellite into a preliminary Parking Orbit. To facilitate the Supersynchronous delivery of the satellite, Falcon 9’s first stage only had the bare minimum propellant reserve for its trip back to Earth and therefore flew a two-burn return profile with no boostback maneuver – continuing on a ballistic arc until hitting the atmosphere. This required the Drone Ship to be stationed 680 Kilometers downrange from the launch pad, further out than recent missions like SES-10. 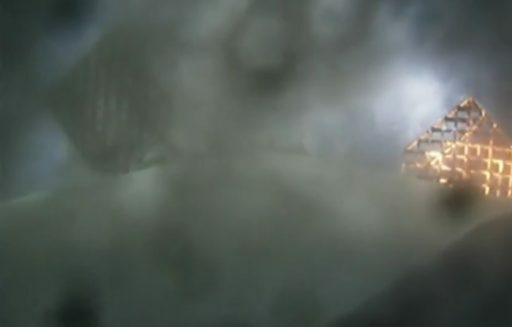 Onboard video from the first stage showed the booster swinging around to a tail-first position before firing up a subset of its engines at T+6 minutes and 30 seconds for a 19-second braking maneuver to slow down by 560 meters per second. When the burn finished, Stage 1 made a quick pitch-up and the heat of re-entry became evident as flames built up around the four deployed grid fins and the camera view was blackened significantly. 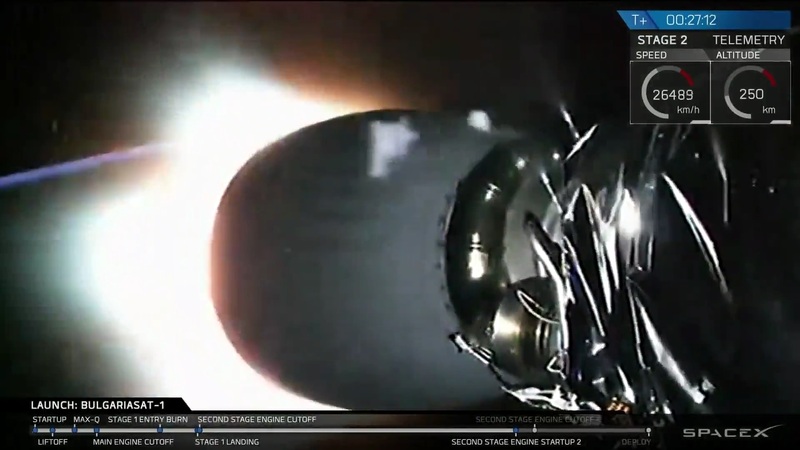 Stage 1 hit the dense atmosphere at around 1,835 meters per second and was in for the highest entry force and heat experienced by a Falcon 9 booster to date, making this the most challenging landing yet. Kinetic energy increases as a square of the velocity and peak heating as a cube of velocity – explaining why even a slightly higher MECO velocity/entry speed will have a considerable effect on the stage’s return journey. To some surprise, Falcon 9 – despite dropping its signal at re-entry – made it through peak heating and entered an unpowered descent through the atmosphere with the booster using its four grid fins to fly out any along-track and cross-track errors to target the precise drone ship location programmed into the flight computer. 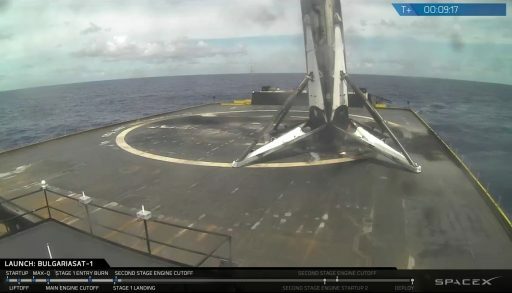 With under half a minute to touchdown, Falcon 9 fired up on a three-engine landing burn that is utilized for particularly fuel-constrained landings to cut gravity losses from the more gentle & controllable single-engine landing burn that is the preferred method for bringing Falcon 9 home. Once called a ‘suicide maneuver,’ SpaceX was able to refine the three-engine landing maneuver to increase the odds of success. 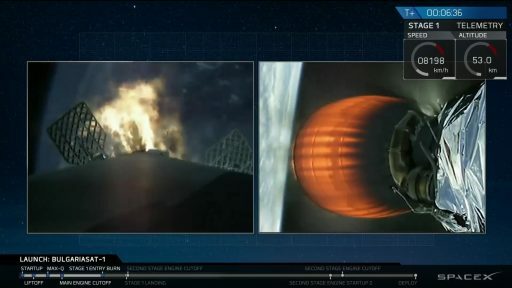 Video from the first stage and drone ship vanished in the last seconds of the rocket-powered descent, but returned to show the booster standing on its four fold-out landing legs for another landing success – also making B1029 the first orbital-class rocket to launch from both U.S. Coasts and landing in the Pacific and Atlantic Oceans. SpaceX Chief Elon Musk noted the booster was ‘extra toasty’ and almost maxed out the crush core capability of its legs due to a hard contact with the drone ship which SpaceX will likely address for future three-engine landings by continuing to tweak the fast-paced sequence. Otherwise, the slightly leaning Falcon 9 booster was reported in good condition. There have been some indications that this mission could be the first to use a contraption affectionately called the ‘Roomba’ – a remote-controlled device that moves about the drone ship deck to secure a landed core without the need to send engineers to a potentially unstable first stage. While the first stage was going through the motions for its speedy return, Stage 2 shed its 13-meter long fairing halves as it reached the tenuous upper atmosphere and continued on toward orbit. It was not known whether Friday’s flight would carry a fairing re-use kit that debuted on the SES-10 mission, comprising thrusters to stabilize the fairing and autosteering chutes to deliver the halves toward an aerial or maritime recovery point. Stage 2 achieved orbit and shut down within seconds of the first stage touching down, entering a coast phase of 18.5 minutes during which it continued on its south-easterly trek across the Atlantic in order to reach the equator for the second burn to set up the typical insertion parameters for a Geotransfer Orbit. Re-Light of the MVac engine was confirmed just after the T+27 minute mark and the burn appeared to reach its 65-second planned duration with MVac throttling down toward the end to maintain a maximum acceleration of 5Gs, achieving a delta-v of 2.68km/s for the second burn. 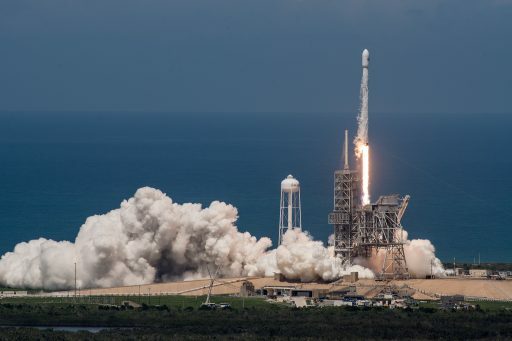 Mission Controllers called out that Falcon 9 reached the intended Supersynchronous Transfer Orbit, stretching from a few hundred Kilometers above Earth’s surface to peak well above the satellite’s eventual operating altitude of 35,800 Kilometers. 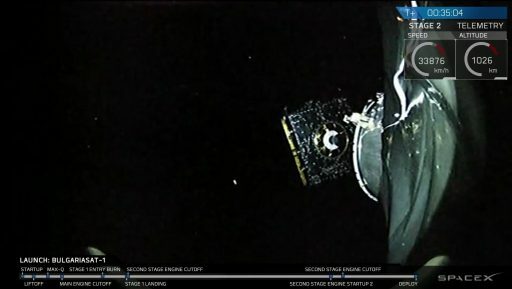 Sent on its way 35 minutes after liftoff, the BulgariaSat-1 satellite was expected to check in with ground stations and begin re-shaping its orbit over the coming days to reach a Geostationary Orbit where its speed matches the Earth’s rotation to allow the satellite to remain in the same spot in the sky, stationed at 1.9 degrees East from where it can cover Bulgaria and a large stretch of Europe. Pending a successful orbit-raising campaign, BulgariaSat-1 is expected to become operational in early August.